Praying for clear skies and good seeing for the lunar eclipse next month! He is an image from the lunar eclipse earlier this year that I am hoping to improve upon dramatically if I can get lucky. I'm the same way. Also hoping I can get a replacement motor for my CG5 so I can go out someplace with a clear view to the east - my neighbor has several very tall trees that block my view that way. So am I. Weather willing, I am planning to photograph the eclipse with my 8-inch EdgeHD and my Nikon F3 camera. I can get the whole moon at 2,000mm on the film in one frame, but with the .7X focal reducer I can get the moon nicely framed by the stars even if the eclipse is very dark. It will cut the exposure times in half. I can take a day off from work so I can stay up late enough to photograph it from start to finish. Edited by Achernar, 08 December 2018 - 12:39 PM. 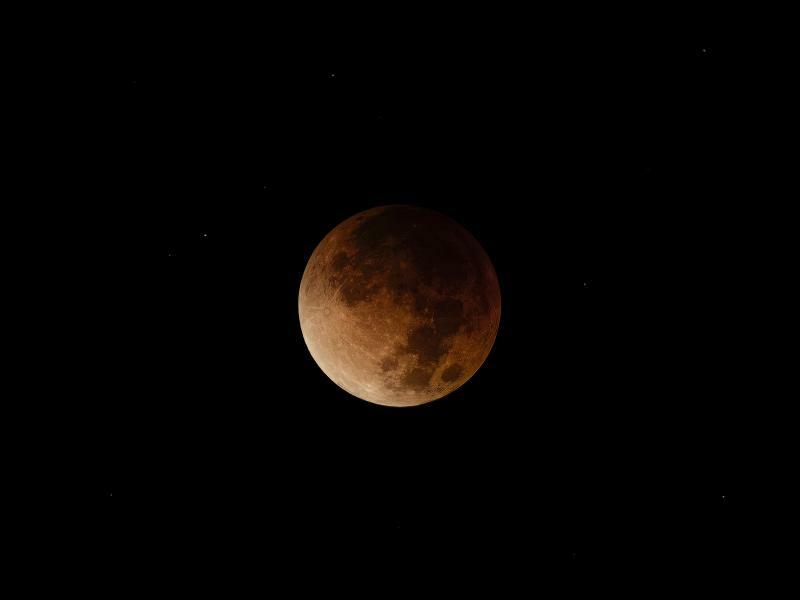 You probably want a pretty wide field to capture a total lunar eclipse. I've often considered my Tele Vue NP127is at f/5.2 with an APS-C format camera to be nearly the perfect setup for imaging lunar eclipses. 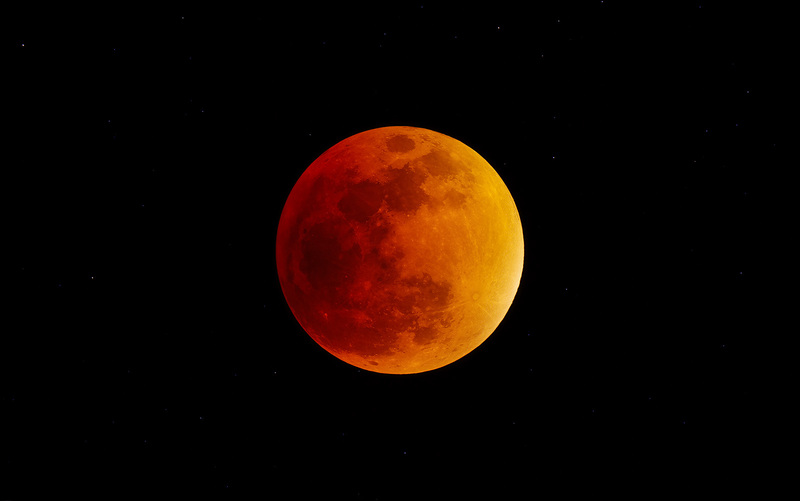 The contrast on the eclipsed moon is pretty low and you're really not going to be able to capture a great amount of surface detail regardless of your telescope. Also, the totally eclipsed moon can be surprising dark and so you probably want a pretty "fast" scope to do the imaging. Here is something I did in September 2015 which was the last "good" lunar eclipse that we had from the west coast of North America. This captured stars down to about the 12th magnitude and the total integration time was 32 seconds (10 x 3.2 seconds). If we have good weather (I'd rate the chances at less than 20%) this will be the first time that I might try to use a dedicated, CMOS, astro camera to image the eclipse as before I've always used a mirrorless Sony APS-C camera. Edited by james7ca, 11 December 2018 - 05:07 AM. Nice capture James. The eclipse last year was kind of a nightmare with having to image in small breaks in the clouds. I also only had a 300mm lens with a 2x teleconverter and was shooting at f/11. My post above came out darker than it does on my screen but I didn't get as much color with the conditions I had, which were pretty bad. I may do a dual setup with my 8" EdgeHD and my Canon 5d M2 and a point and shoot on a tripod. This is provided we have clear skies which is really more miss than hit at that time of year. Good luck with your efforts. Hope you have clear skies! In case anyone hasn't run across this yet, the US Naval Observatory has an excellent local circumstance calculator online. Now you can know when you need to be set up because it changes depending on where you are. Still won't help with Michigan clouds in January, but at least I'll be able to point to a specific cloud and blame it for being in the way.